Trip hop music and electronic music with voice and didjeridoo. Ohm Sweet Ohm are the Oneiric voice of the Singer and psychedelic groove of the didgeridoo - an ancient aboriginal instrument originating from Australia - melt with electronic music create an atmosphere where tribal instruments and urban soundscapes are brought together. 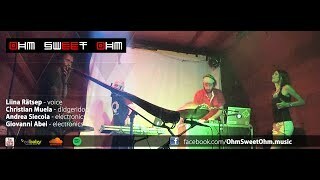 Ohm Sweet Ohm has played at several international festivals like Earth Garden (Malta), Crack Festival (Rome, Italy) or Rythmik Festival (Sestri Levante, Italy). During the winter they published their second ep „OHM SWEET OHM.Livesession1“, and are currently working on new songs collaborating with Giovanni Abei (Bludiste) and Andrea Siecola (Shanti Lion Project).